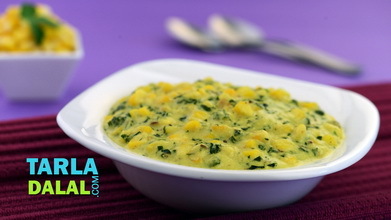 Many of the best loved vegetarian punjabi dishes are the ones where paneer is combined with a vegetable. 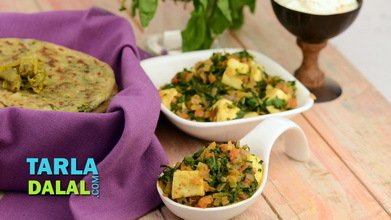 Paneer is widely used and very popular in punjab due to the abundance of milk and milk products in the area. 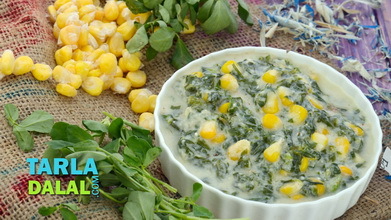 This combination of spinach and paneer is not only highly nutritious, but is a splendid blend of taste, texture and flavour. 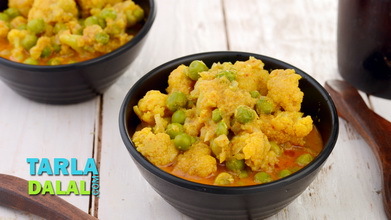 The paneer in this recipe has been fried to add some extra flavour. 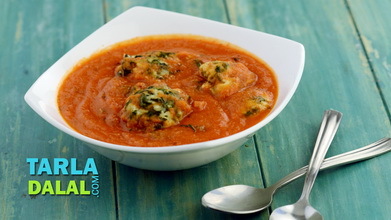 You can however add the paneer pieces without frying if required. Blanch the spinach in a vesselful of boiling water for 2 to 3 minutes. Drain, refresh with cold water and keep aside to cool for sometime. Blend in a mixer to a smooth purée and keep aside. Heat the oil in a kadhai , add the onions and sauté on a medium flame till they turn translucent. Add the garlic, ginger, green chillies and turmeric powder and sauté on a medium flame for 1 to 2 minutes. Add the tomato pulp and sauté till the mixture leaves oil, while stirring continuously. 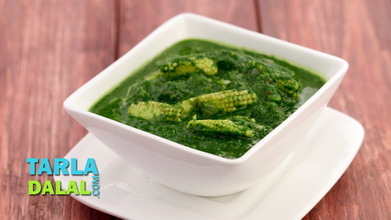 Add the spinach purée and 2 tbsp of water, mix well and cook on a medium flame for 2 minutes. Add the salt, garam masala and fresh cream and mix well. Add the paneer, mix gently and cook on a medium flame for another 1 to 2 minutes. 4 bunches of spinach will approximately yield 10 cups of chopped spinach.